Three branches founded by brothers Jan (*1747), Jiri [George] (*1748) and Josef (*1750) are described thoroughly in "The book" of Vyborny family. A brief translation that describes the family of Jan (*1747) is presented below. Jan looked after his younger brother's families after their deaths. Explanations or comments regarding the translation are given in  brackets. Jan, Vacslav, Josef and Jiri [George]. where he lived for some time (1792-94, 1796-1802). Most of his children born there died quite young. By 1805 he was at Pritoka village at the free farmstead No.15. His son Vacslav was born there on Oct 7, 1808. His archive records could not be found at a later time. He moved to Cerhenice and maybe even died there. It is known that when they lived at Pritoka, his wife Katerina and katerina Vancura of Kalabousek donated a gold cup to the evangelic church at Mocovice. None of the Puker [Pucher] neighbors knew him (they could recall only two Vybornys living in Pritoka that time - Jan the son of Jiri of Puker No.2, the brother of Josef living in Cirkvice used to visit them). Only Matej Vejborny of Mancice (the son of Josef Vyborny "Koutecky" of Libenice No.8) had known him. He said Jan was of a medium height conspicuously quiet an temperate. His son Vacslav and daughter Katerina survived him. Mr. Prochazka of Caslav told us that their farmstead at Pritoka No.15 contained 120 korec [about 85 acres] of fileds in two pieces. Vacslav the son of Jan sold the farmstead at Pritoka and bought the mill (Nouzov) at Svojsice. He married Marie Svejkovsky of Ceslice near Ricany in the year 1829. He died quite early ....They had only one son who was still single when he died in an accident at the mill (according to the information of J.Novak of Rabstejnka mill [a close relative of Josef*1864 - either an uncle or grandfather of Josef*1864]). Vacslav used to also live at mills later (according to Mr. Prochazka). His daughter was the mother of Mr. Kotek the town secretary of Lysa town. The widow of Vacslav later lived as a private person in Kourim town. Some members of Mojzis family had emigrated to Prussia after the battle on the White Mountain. Around 1735[?] Jiri [George] and Josef were known to have brought [prohibited] religious books to him [7Vaclav(*1774)]. They encouraged many of other people to escape to Germany. At Krechor and at the district of Podebrady, Jiri and Josef were well known to be very active in encouraging field-masters and millers especially [to leave Bohemia]. from Srbce near Podebrady and he [7Vacslav*1774] settled at Novy Kolin No.19. His son Jan was born there on Oct 20, 1800. By 1802 he moved to Libenice No.45. The next year 1803 his wife Dorota died (because of "a stone") at the age of 29. 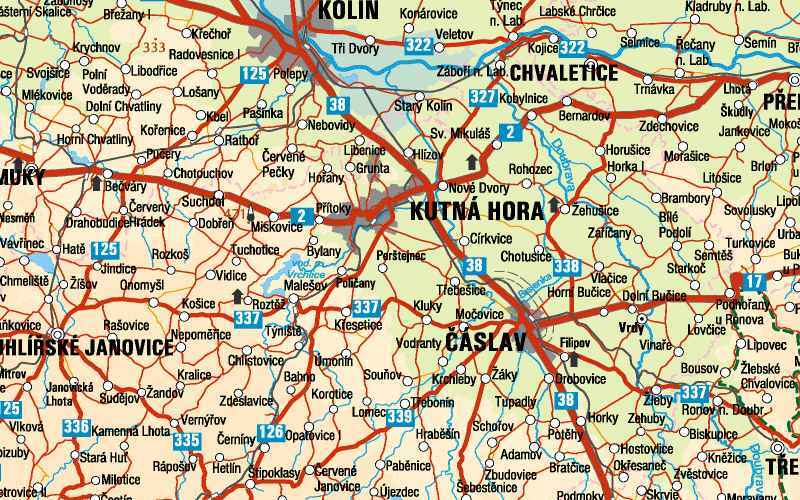 The same year 1803 Vacslav's younger brother Josef [7Josef*1779] moved to Libenice No.8 after a short stay at Horany (the same time Vacslav's older brother moved to Pritoka). So that time there were at Libenice many of Vyborny's family members, as there were not only those two brothers there but also two aunts married to Vacslav Kratky and to Jan Mojzis. In 1804 (on the Holiday of St. Jan) Vacslav [*1774] married a second time to Katerina Kotrba of Vidice (born at Vrdy) who was 17 years old. They had several children; however, only Vacslav, Josef and their daughter Alzbeta [Elizabeth] survived. The Protestants of Libenice originally belonged to the evangelic church of Mocovice. They were, therefore, in continuous contacts with their friends at Puker. Only after a new evangelic church was built  at Libenice, did their contacts become less frequent. I [Josef*1864] had not been told anything about him [7Vacslav*1774] except for a brief description given to me by Matej Vejborny of Mancice. He was an excellent farmer (as were most members of his family branch "of the upper end") and was praised by everyone especially for his hard-working nature. His oldest son (from his first marriage) Jan [6Jan*1800] married Katerina Vancura on Jan 25, 1820. They lived at the farmstead of her deceased father Tomas Vancura at Mocovice No.29. Katerina was the youngest of five daughters. Two of the other [sisters] lived at Mocovice too; one sister was married to J.Brych and the other to Horalek. The former farmstead No.29 of Vancuras was thus transferred to the Vejborny family. Jan, therefore, became the founder of the Vejbornys of the Mocovice branch. Jan [6Jan*1800] was a hard-working man, circumspect, taciturn, quiet or even self-conscious but still an excellent farmer. He was a tall and thin with brown hair. He had a mark on his face and wore a short beard. He had little hair by his last years, but still had all his teeth. He used to wear a cap on his head at home. He liked to smoke a pipe very much...His gestures and movements were very similar to those of his son Matej [5Matej*1841, the father of the author of "The book"]. His face was said to be similar to the face of his son Josef except it was more oblong. His eyebrows were short and heavy (located at one place only). As a young man he visited a tailor at Kank, who had been a soldier, to learn German. So he knew some German. On Sundays he often liked to take walks from Mocovice to his birthplace [some 30-km or more there and back]. Beekeeping was his great hobby. He avoided any conflict with others ... Although he read newspapers and was informed about political events, he was not engaged in public action. The main feature of his character was thriftiness. He did not like if the children were too interested in books instead of doing other necessary work at their farm. He was married two times as his first wife died on Feb 1846 (because of TB according to the record in the death registry) when most of his children were small. He [6Jan*1800] had five grown sons (Vacslav, Jan, Josef, Frantisek, Matej) and three daughters (Marie, Katerina, Anna) - later all of them had their own families. His [6Vacslav*1807] younger daughter [Anna] married somewhere in the region of Podebrady [to Planany]. Another son was a tailor at Dolany - a tall, black-haired, and righteous man. Those children grew up with the Vokals. [After the death of both their parents in 1847] the farmstead [No.45] was sold in an auction and Vacslav's [6Vacslav*1807] brother-in-law Vokal bought it. 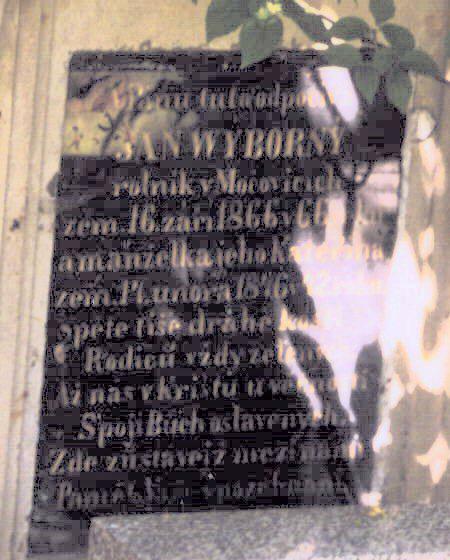 The third son of Vacslav [7Vacslav*1774] Vejborny, Josef [6Josef*1809], married the daughter of Jan Taborsky of Onomysl and settled at Dolany.... His [6Josef*1809] son married a rich widow of Brezany near Cesky Brod town and he later possessed two large farmsteads at Dolany. The daughter Alzbeta [Elizabeth] (*1812) of Vacslav Vejborny [7Vacslav*1774] married a Vokal of Libenice, who obtained her father's farmstead. was Jiri [George] Vejborny born around 1780 at Puker, at the "familije" [farmstead] No.4. He helped his father [8Jan*1747] continually and he became a very hard-working farmer. By the year 1801 he obtained the farmstead No.4 (it seems the other farmstead No.7 was entrusted to him even sooner). His father leased out the vast farmstead of Oumonin and he became retired at that time. However he [8Jan*1747] continued to keep "his protective hand" by looking after his family and the families of both his late younger brothers [8Jiri (*1848) and of 8Josef(*1750)] as well. ... and their son Josef was born. His other children were the following: the son Jan (*1811), the daughter Anna (*1815), the son Vacslav (*1819), Barbora, Marije (*1823) and the last son was Jirik. Jiri was of medium height and very stocky. He was extremely strong (nobody from that region was as strong as he). His mother was certainly of a smaller height, being a typical Kratky [the Czech name "Kratky" means "short"]. When he worked on his fields, he was ever ahead of the other farmers. In fact, his zeal to work almost killed him. Once when a high heap of shock was falling down, he tried to support it with his pitchfork. Since that time he had to use crutches (probably due to hip fracture). His [7Jiri*1780] wife was rather tall and was a very hard-working housewife. Both of Jiri's parents lived with him after their retirement. On Jan 30, 1814 his mother, Alzbeta nee Kratky of Oumonin died at the age of 62. In 1824 the whole district of Oumonin was auctioned. Jiri was among those farmers ["familijants"] trying to buy this district as a co-operative with other farmers ["familijants"]. It was never purchased due to their failure to agree and their indecisiveness. Jiri's cousins used to meet quite frequently at his house between 1830-1840 (there was no working inn at Puker that time, as the inn-keeper Vacslav was not interested in his profession). his only daughter Anna (*1825) married a Vasa later. On Apr 25, 1826, Jan Wejborny the last member of the first "familijants" died at the age of 78 (82 according to the registry). He passed away in his retirement house No.7 Puker. He was the oldest ot the three [the first evangelic] brothers. He was buried in the cemetery of Mocovice. Only Barbora, Jiri's [8Jiri*1748] widow remained of Jan's contemporaries at farmstead No.2. In, 1831 Jiri [7Jiri*1780] rebuilt his house No.7 in a more modern style (adding the second floor). The stone barn was built even earlier. The same year his [7Jiri's] daughter Anna married Jakub Vancura of Potehy. In 1833 Jiri bought house No.6 for his son Jan [6Jan] from his neighbor Simunek (which included 62 mira [= about 30 acres] of the fields belonging to the farm)... As a young boy Jan attended the evangelic school at Opatovice. Jan married Anna at Siegfeld,... then he moved to Zdechovice. His [6Jan's] children went to different places. Some of them became clerks (one to Hungary as the head of certain railroad station, another as a sergeant in the army) *). **) the record in the registry of Kolin: on Nov 19, 1839 Vacsl[av] Vejborny the son of Jiri, the "familijant" of Puker No.7 and M. nee Vancura of Mocovice No.11 of the hel[vetic] relig[ion] married Anna the daughter of Pavel Cejka, the familijant and the inn-keeper of Cisaroves (Kolin) No.20, and Rozalie nee Mojzis of Srbce age 17, of the helv[etic] relig[ion]. Two of Jirik's daughters were married at Puker: one to Vacslav, the son of Matej of the "familije" No.2 [the branch "of the lower end"], another to Josef, the son of Jan ["of the little cottage" branch]. Those marriages strengthened the bonds between all the three branches of Vyborny's living at Puker, once more.